The monument after flowers and pictures were removed. 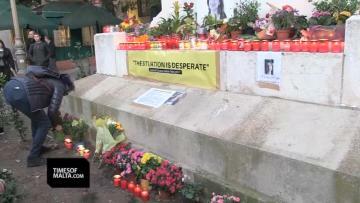 An unofficial memorial to slain journalist Daphne Caruana Galizia cleared overnight was back by Monday evening, as activists quickly replaced flowers and candles at the Valletta site. 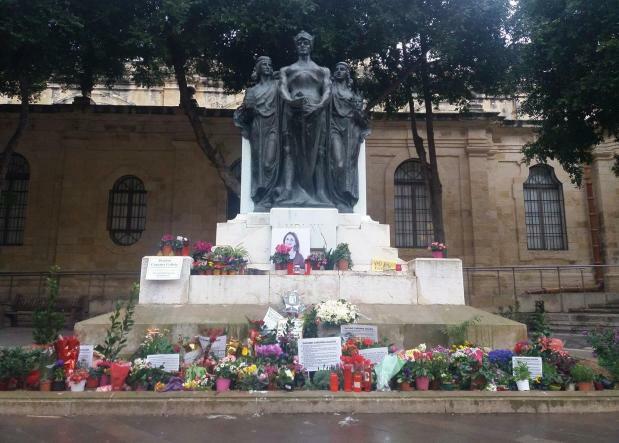 A new picture of Ms Caruana Galizia and fresh flowers were placed at the foot of the Great Siege monument in Valletta on Monday morning, with a crowd of around 150 people gathering in the evening to lay further candles and light candles in her memory. It is not known who removed the pictures, flowers and candles but the operation was clearly planned, and the flowers were taken away and not placed in the nearby bins. Some flowers, however, could be seen on the ground. 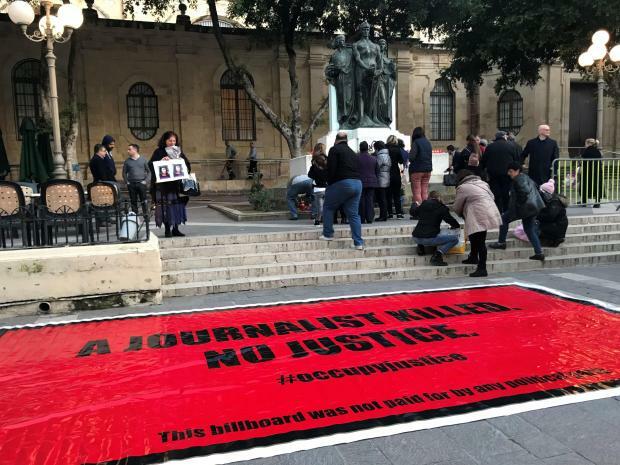 The Occupy Justice group on Monday morning called on the public to head to Valletta in the evening to replace the makeshift memorial, and people flocked to the area from 6pm onwards to pay their respects. Activists from the group lay a billboard banner reading 'A Journalist Killed. No Justice' on the ground by the memorial, just outside the law courts. The memorial had served as the centre point of vigils and protests since Ms Caruana Galizia was killed by a car bomb on October 16. The memorial was the subject of much controversy, especially after pictures of Dom Mintoff, Karin Grech and Raymond Caruana were added to the memorial when efforts by a Valletta councillor to remove the memorial were quashed. 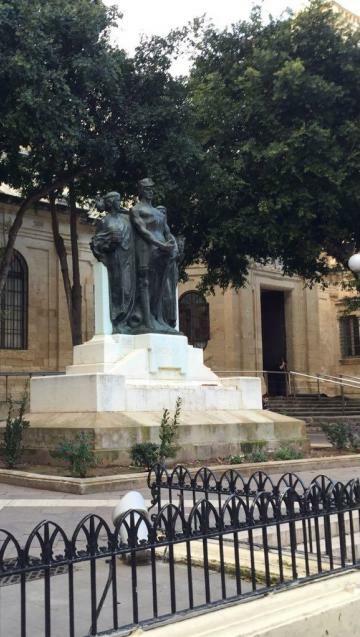 Occupy Justice vowed within hours to restore the memorial to Ms Caruana Galizia. "We will be gathering at 6pm tonight to pay our respect by placing flowers and candles. We will not allow this government to brush the assassination of a journalist away from the public eye. "Justice has not been served and we will continue to gather at this memorial created by citizens until justice has been served," the group said. The Civil Society Network has said it is in the process of formally applying for a memorial to Ms Caruana Galizia in Great Siege Square, a proposal which drew strong objections for some quarters. 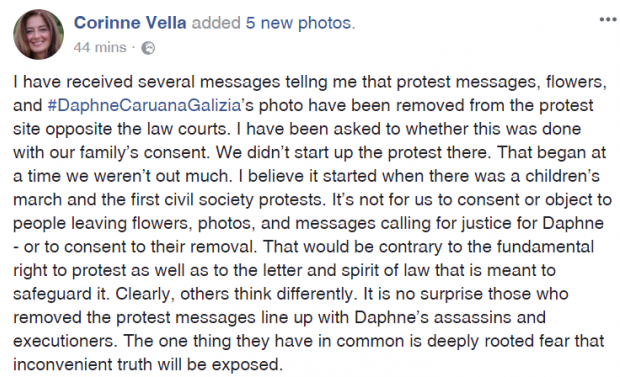 A Facebook post by one of Daphne Caruana Galizia's sisters. The memorial as seen on February 20.